Line individual serving plates with lettuce. Arrange pear slices in fan shape over lettuce on each plate. 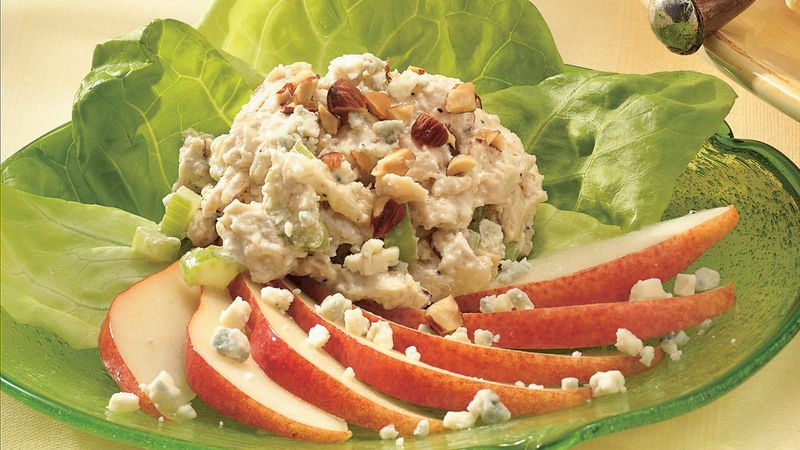 Spoon 1/2 cup chicken salad onto bottom half of each pear fan. Sprinkle with cheese and almonds. Any chopped toasted nuts can be used in place of the almonds. Walnuts or pecans are especially good partners for the pears and blue cheese. Drained canned pears can be used in place of the fresh. This recipe makes a nice light lunch or dinner entrée. Serve it with seasoned breadsticks for a simple summer meal.